In cooperation with the M.V.Lomonosov MSU, ILIT RAS has developed a unique technology permitting an investigation of eye retina with the spatial resolution at the level of the size of individual photoreceptors. The technology makes use of the methods of eye aberration active correction to obtain the diffraction limited image quality. The analysis of eye dynamic aberrations and their correction with bimorph deformable mirrors are performed in real time (30 measurements per second). This allows almost complete elimination of distortions, and generation of the retina images with the angular value of 15° to 20° and the spatial resolution of 3 to 4 m m.
The produced images are recorded by a digital fundus-camera of ultra-high resolution (6 to 16 million points). 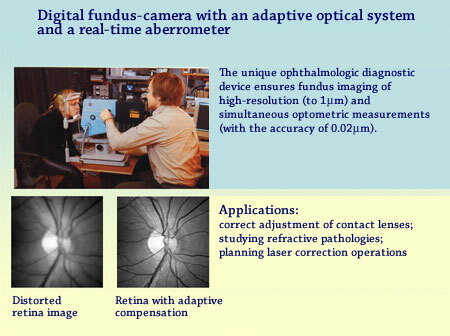 The device permits high resolution fundus imaging and simultaneous taking optometric measurements. The obtained data can be used for correct adjustment of contact lenses, in studies of refractive pathologies (e.g., keratoconus), for scheduling and planning the operations on laser correction of vision.